Sunday Forecast: SEEDY and SUNNY! 07 Feb Sunday Forecast: SEEDY and SUNNY! We are open from 9 am till 4 pm this Sunday, February 10th. Please note that it is the ONLY day we will be open this winter. Next week we will be starting to pack up for the CT Flower and Garden Show in Hartford January 21-24th. Not only will be have our usual jam packed double retail booth, both Diane and I are speaking. The lineup of speakers is really wonderful this year, and I have heard that the gardens are looking to be spectacular as well. We will have discount flower show tickets on sale on Seedy Sunday if you haven’t bought them yet. 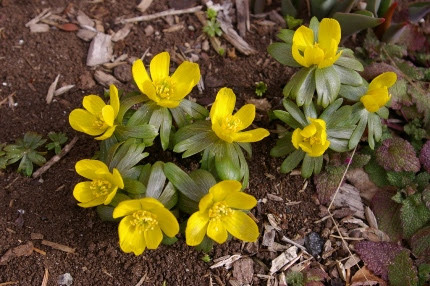 Winter aconite bulbs are the first to bloom. If yours are planted in a sunny spot, go check to see if they are open like ours are. One of the first signs of spring is the emergence of our winter aconite bulbs on the south side of the shop. Monday afternoon Diane and I went scouting for early life in the gardens and sure enough, they were popping up and opening before our eyes! Are your snowdrops emerging yet? Also emerging this week are the snowdrops. We have an old stand in the front of the shop that were there when we moved in 29 years ago. They have continued to spread and reseed into many of our gardens. 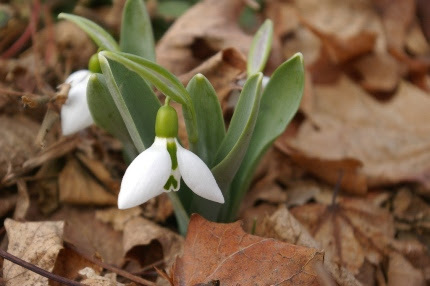 You will notice that my snowdrops at home (seen above) are growing up through a mulch of fallen leaves. Yes, bulbs poke right up through the leafy carpet and those leaves break down and feed my soil. the left are all breadseed-type poppies. We have a lot of new varieties this year, including ‘Zair’ that features closed pods and very flavorful poppy seeds- the best for cooking. There are many deep burgundy reds, tons of doubles, and our old favorites as well. It is a good idea to purchase your breadseed poppy seeds now as they need to be sown on frozen soil in March to help them germinate. 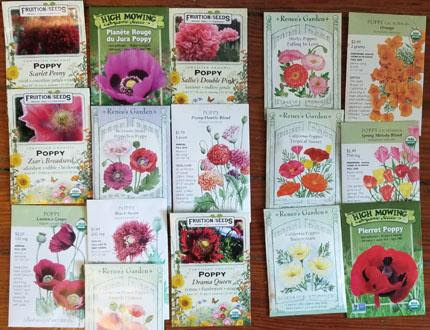 The two rows of seeds on the right are other forms of poppies that we carry- Iceland, Shirley, California, and ‘Pierrot’. Poppies self sow if they are happy and they often cross and new colors appear in your garden. Say it with seeds! 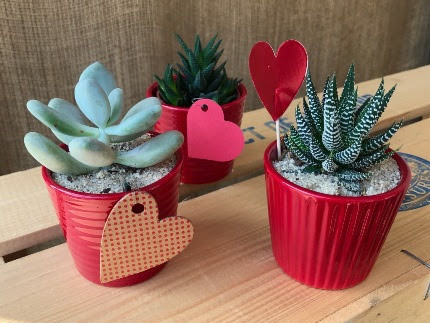 Give seeds to your Valentine. Many can express your sentiments very well. I had fun putting the seeds in the above picture together. Valentine’s Day is next week and I noticed that lots of our seeds had names that would fit right into a Valentines’ Day gift: love-in-a-mist, exotic love vine, love-lies-bleeding, kiss me over the garden gate, falling in love poppies, the birds and the bees sunflowers, and of course all kinds of chocolate references such as ‘Chocolate Cherry’ sunflowers. 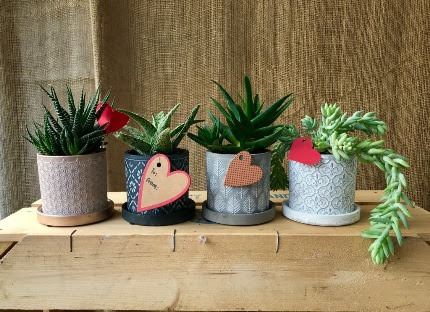 Why not buy a gift certificate to Natureworks for your valentine and box it up with a collection of seeds. Now THAT is a gift that will last all summer long! I have been growing microgreens on my windowsill this winter and they are just so easy to care for. I literally sowed the seeds and they were up in a few days. To my surprise, my husband (who is a very traditional eater) was very excited about this super-nutritious addition to our diet. We all crave and need fresh greens at this time of year. You don’t need a lot of space, and they only take a few weeks the most to get a harvest. I will keep sowing and harvesting them until I can start growing greens again in my garden. One of my personal goals for Natureworks this year is to encourage my customers to grow lots of flowers for cutting, arranging fresh, and for drying. On the left you can see some of the seeds for dried flowers that we are stocking. Craspidia (the yellow balls on the left) is quite an amazing flower, both fresh cut and dried. 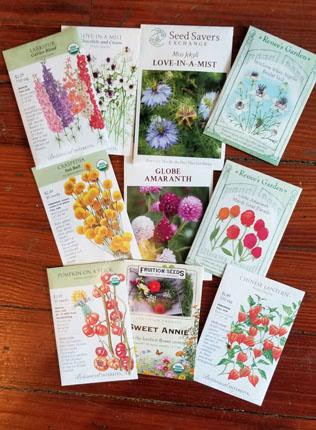 Globe amaranth, love-in-a-mist (Nigella), strawflowers, statice, larkspur, and the cute pumpkin-on-a-stick (actually an ornamental eggplant that dries well) are all things you can grow in your garden. 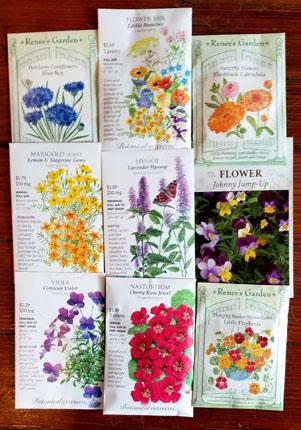 We have tons of seeds for fresh cut flowers too. Zinnias? Oh my goodness, we have so many new varieties this year, all sizes, colors, shapes, and forms. Snapdragons seeds can be started indoors now and put out in April- they can grow cool. 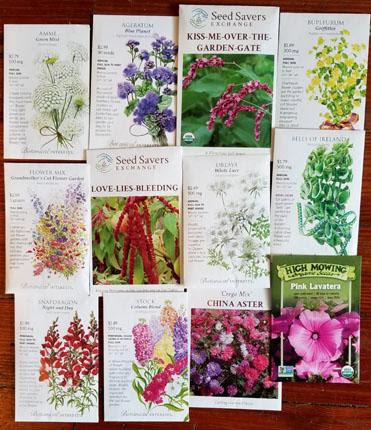 We have the seeds for the popular filler Buplerum, Ammi majus (which looks like Queen Ann’s lace but is an annual), stock (another one to start early and plant out early), and Ageratum houstonianum, a tall, cutting Ageratum that we normally just sell as quart sized plants. Bells of Ireland, China asters, pink annual Lavatera, and so much more fill our flower racks right now. You can be sure that not only will I be writing about this passion of mine, we will also be teaching workshops and doing some Facebook Live videos about it. Speaking of classes, our 2019 Winter and Early Spring Class List is out. We posted it on Facebook last week and have been taking on-line signups every single day. We are really excited about this year’s classes. We have Kathy Connolly coming to teach us about meadow gardens during our Have a Happy Habitat Day. We have Sue Lavallee coming to teach us about raised bed gardening. Many Natureworks employees are also going to teach this year, along with yours truly. Sign up today- it’s really easy to register on-line. We will have printed copies of the Class List on Seedy Sunday as well. Spread the word, tell your friends. These classes are so educational and fun- plus you get to hang out with a bunch of other gardeners. What could be better? See below for the link that will bring you right to our website where you can read all about the classes and register on-line. Don’t wait- register today! A winter email wouldn’t be complete without pretty pictures of flowers. 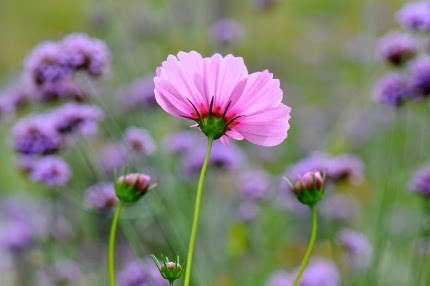 The pink cosmos and purple Verbena bonariensis above are both SO easy to grow from seed. You can direct sow them in May, or start them ahead of time indoors. 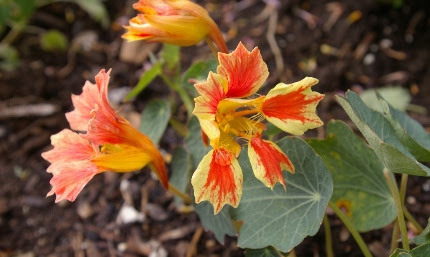 These are ‘Phoenix’ climbing nasturtiums shown above. They can also be easily grown from seed. Don’t you just love these cut flower petals? They are almost too pretty to eat, but you CAN eat the flowers of all of our many nasturtium varieties. They are filled with vitamin C and add a zippy flavor to salads. Nasturtiums aren’t the only edible flowers we carry. 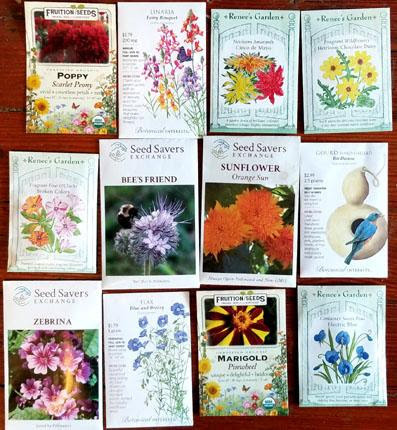 Shown on the right are seeds of many more, including ‘Lemon Gem’ marigolds, bachelor’s buttons, calendulas, anise hyssop, and even some mixes that offers a nice variety in one envelope. The way we set up our racks is pretty unusual. We purchase organic and non-treated, non GMO seeds from many vendors. We then weave all the vendors in together, so that you can shop all the nasturtiums and all the beans and all the cucumbers easily. 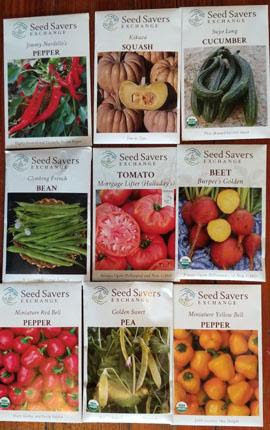 The only exception are Seed Savers Exchange seeds as they have oversized packets and merit their own rack. But this is such an important seed company to support. They are dedicated to saving our seed heritage. 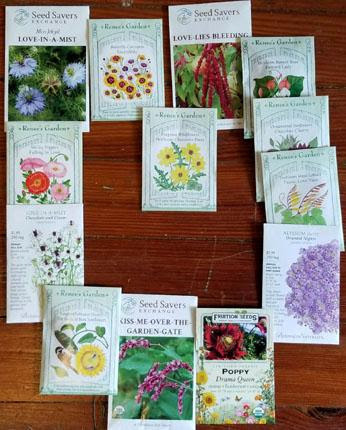 With so many of our seed companies being bought up by large corporations, and so many varieties being patented or sterile, it is critical that we all grow open pollinated seeds and learn to save our own and exchange them with our fellow gardeners. 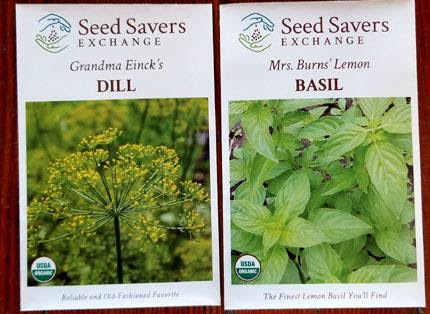 A good example of superior heirloom seed varieties are two of my all-time favorite herbs shown above from Seed Savers. ‘Grandma Einck’s’ dill is amazing. We grow it here in our shop gardens and I also grow it at home. It is grown for giant seed heads and the dill seed they produce. Those flowers are a magnet for beneficial insects and pollinators and the dill plant is the larval food plant of the Eastern black swallowtail butterfly. 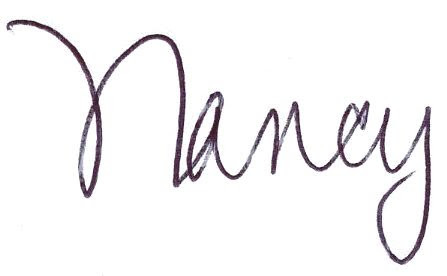 ‘Mrs. Burns’ lemon basil is also a wonderful heirloom. With the arrival of downy mildew on a lot of our standard basils, it is good to know that lemon basil is resistant. Use it to flavor fish and chicken dishes and brew it into a refreshing iced tea. You will be delighted at its flavor and its vigor. So I am sure you have heard the old adage “Sow your peas on St. Patrick’s Day”. Well, in CT, that isn’t always possible as the ground could be blanketed with snow or frozen solid. Peas like cool weather to grow their vines. When it gets hot, they start to flower and form peas. So an early start is warranted, but you have to use your common sense. I take advantage of warm spells and open ground to cover my pea beds with black plastic to warm them up and dry them out. 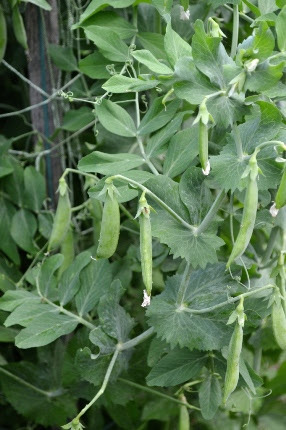 I grow sugar snap edible podded peas, they are just so sweet and delicious. If you are in a small house or apartment, we have dwarf forms of most of our veggies that will be perfectly happy in containers. make you SO happy to be here, talking gardens, and sharing the excitement of the growing season that is on our doorstep. We will have a tag sale going on in the greenhouse (BARGAIN ALERT!!!) 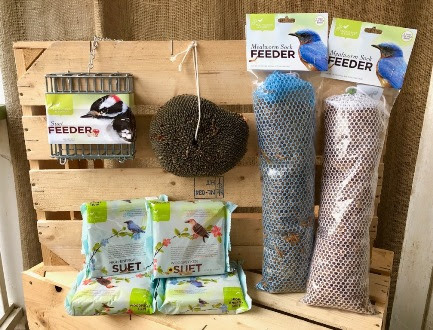 and we will be fully stocked with the most awesome bird feeding line I have ever seen. This was supposed to arrive in time for the Christmas season, but didn’t get here until January. So on Seedy Sunday, stock up. If you put out a mealworm sock and a suet feeder that also has insects in the suet, you will be astounded at who you will see at your feeder. This company is woman owned and the products are designed and made with great care in America. 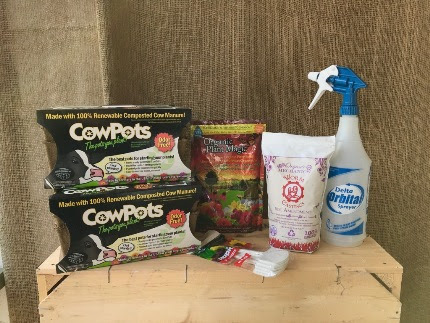 Organic seed starting supplies are in the house! Share this email newsletter with all of your friends and tell them all about Seedy Sunday, classes, and all of the other exciting happenings at Natureworks this winter. Don’t let ice, snow, or cold get you down. The garden is the solution for that. Try something NEW this year!